How Many Calories Do You Burn Running a Half Marathon? Is it Better to Run Faster or Longer? Your heart rate provides important information regarding the health of your circulatory system during exercise. The American Heart Association recommends exercising at an intensity that causes your heart to beat at a range of 50 to 85 percent of your maximum heart rate. A heart rate above this range, especially if it exceeds your maximum heart rate, may not support your fitness goals. For women, heart rate requirements suggest re-thinking the old heart rate calculation. Your heart rate during a workout is an important factor in monitoring how your body responds to the stress of exercise. Age plays a major role in determining maximum heart rate. The classic formula used your maximum heart rate equals 220 minus your age. But, as "The New York Times" reports, this heart rate calculation actually penalized women, who were often working out too hard. The calculation for women is 206 minus 88 percent of your age. For a 20-year-old woman, the maximum heart rate is approximately 188 beats per minute. 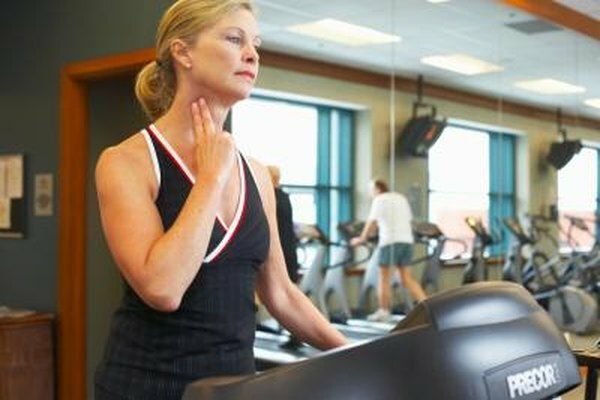 For a 40-year-old woman, the max heart rate is approximately 171 beats per minute. And for a 60-year-old, the max heart rate is 153 beats per minute. Eight-five percent of these max heart rates is significantly lower than previous estimates. Aerobic exercise involves repetitive movements of your large muscles. Aerobic exercises include running, kickboxing, cross-country skiing and swimming. These exercises require oxygen to break down fat and glucose, creating energy to fuel your workout. Anaerobic exercise, such as weightlifting, doesn’t require oxygen to supply energy. Anaerobic exercise generally has a milder effect on your heart rate, although both types of exercise may cause your heart rate to go above the maximum rate. As noted in "The New York Times," going above your max heart rate isn't necessarily bad, but it can fatigue you too quickly, making your workouts less effective. Tachycardia is the medical term for an excessively fast heart rate. While a fast heart rate during rest may have a variety of causes, a fast heart rate during a workout may simply be the result of exercising at too difficult a level of intensity. Decreasing the intensity of your workout may help bring your heart rate back into the target zone. If you've found working out frustrating and defeating, it may be because you've been working to the wrong numbers. Some individual experience a condition known as atrial tachycardia, a type of tachycardia that occurs during exercise. Paroxysmal supraventricular tachycardia is another name for this condition. This condition can cause your heart to beat between 160 and 220 times a minute. Strenuous exercise, such as weightlifting, can cause this temporary increase in heart rate that exceeds the maximum rate. Although this can resolve on its own, Merck Manuals recommends seeking medical attention for an episode that lasts longer than 20 minutes. Contact your doctor immediately if pain, light-headedness or confusion accompanies your racing heart beat. Abnormal response to exercise is also an increased risk of heart attack, so contact your doctor if you find your heart rate is regularly above normal. What Is Considered High Sugar Level?